A few days ago I was invited to be a guest on the “Basic Block” podcast - probably the most popular crypto podcast in Russia. In spite of me writing a note on what I’m going to say & key points, which you can read here, I sucked at it. At least that’s how I felt after doing it. Fortunately, Basic block radio is one of the few podcasts, where authors take on the hard job of editing an episode. Thanks guys! So what you end up listening is the edited (often abridged) version, not the original conversation. После заключения договора купли-продажи, нужно перезаключить договора на свет, газ и воду. Для этого берите паспорт(а) РФ, паспорт БТИ (для газовиков), договор купли-продажи и выписки из росреестра о собственности. 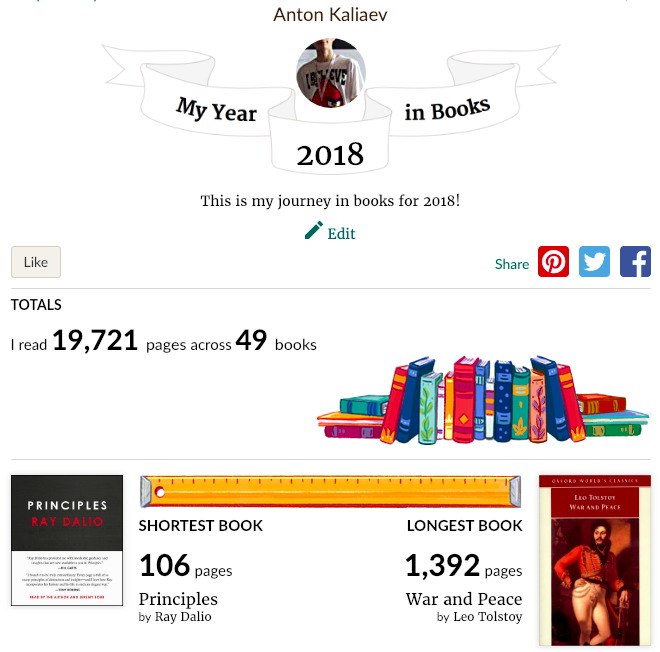 Another year, another goal - read 55 books in 2018. I failed to reach my goal of reading 50 books in 2017 and … dropped the ball this time too. Why set even more ambitious goal instead of lowering the expectations? Because lowering feels like a step backwards and one should always strive to move forward. I am still happy with the result - 49 books!